In the early 1960s, there used to be 50 hunters, give or take, that lived here throughout the winter, in Johnny’s Trailer Park, to hunt the rich El Fuerte Valley. 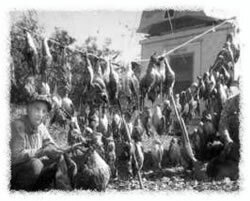 Most hunters were accompanied by their wives and twice a week they held very lively cocktail parties and potluck dinners. I hope to find some pictures, soon, to put on this site, because once each month a table was set for all their great hunting dogs. The dogs were regarded as the guests of honor, fit with bibs, and given the best food in town, as reward for faithful and loyal service. Doves, Ducks and Quail abounded in the farmlands and wetlands. Clem Warner was one of the original few hunters to discover the joys and rewards of this sportsman’s paradise. All members of this core group of great, old hunters have since moved on to happy hunting grounds in the sky–including my father, Clem. Dave Warner is the only direct descendant of this bunch to carry on the tradition of hunting the Ahome area . Johnny’s Trailer Park no longer stands, BUT…he is now sharing this long-kept secret with you, after twenty-odd years of hunting with friends and family. In 1980, Dave purchased 2.5 acres of land from another dear friend and hunter, Frank Irvine, in Ahome, Sinaloa. Dave immediately recognized the land’s full potential. Being located only thirty minutes from Los Mochis International Airport , but far enough from the hustle and bustle of the historic city to allow peace and relaxation, Dave’s new property could easily serve the international sportsman. 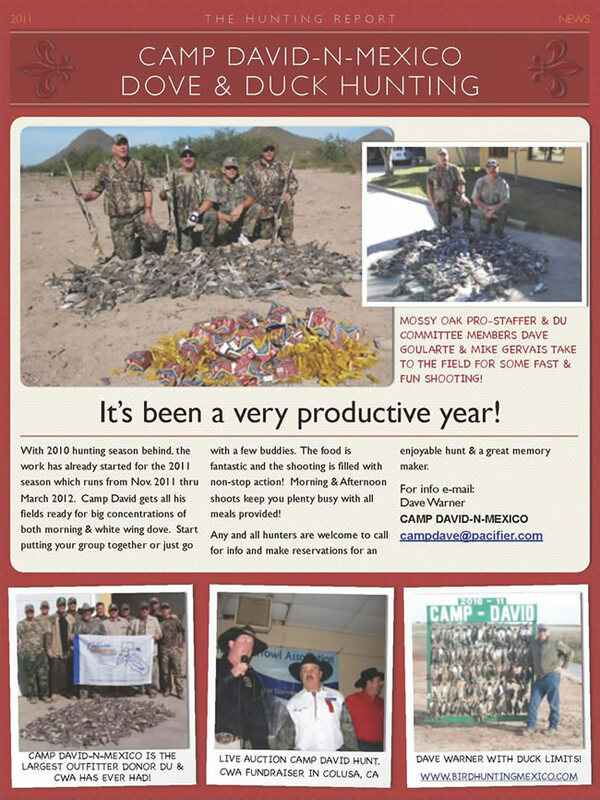 Over the past twenty years, Dave developed the land into the most majestic and comfortable hunting camp in all of Mexico . This includes a brand new hunting lodge with accommodations for up to ten hunters. Finding a more relaxed and enjoyable atmosphere, including better beds and food, anywhere in Mexico , would be quite a feat. This 11,000-square-foot Lodge encompasses an imposing amount of area, due to its spacious, high-ceilinged rooms and large wrap-around tile veranda. Ten bedrooms and ten baths, fitted with the most comfortable beds in Mexico , retain our guests’ privacy and comfort. All this while our large, open living and dining area, fully-equipped with twenty-foot dining table, bar, card table, TV, computer, reading chairs and lounge, allow us the opportunity to afford our guests all the amenities of life in the States, including home-cooked meals, the best margaritas around, and even E-mail to keep you in contact with family and friends. Leather couches, reclining lounge chairs and authentic rockers aid the weary hunter in recuperation for the next big outing. The grounds outside the lodge provide serious competition with the beauties inside. Lush grass, towering palm and fresh fruit trees and flowering Bougainvillea enhance wonderful, relaxing atmosphere here at Camp David . While enjoying your margarita of Pacifico Cerveza, nightly campfires are held to reflect on the memorable hunting and best shots of the day, and to relish in anticipation the success we know we will have on tomorrow’s hunt. We truly wish to share the hospitality, atmosphere and incomparable hunting here in our private hunting paradise.